To contest, all you need to do is listen to the EP, pick your favorite song and dance to it while a friend records you. 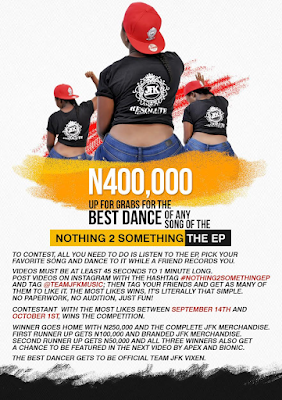 Your video must be at least 45secs- 60secs long.. Post your video on Instagram with the hashtag #Nothing2Something and tag @teamjfkmusic: then tag your friends and get as many of them to like it. The most likes win. it’s literally that simple. Contestant with the most likes between September 14 and oct 1st wins the competition. Winner goes home with 250,000 naira cash and the complete JFK Merchandise. First Runner up gets 100,000 naira cash and Branded JFK Merchandise. Second Runner Up Gets N50,000and all three winners also get a chance to be featured in the next music video by Apex and Bionic. The Best Dancer gets to be the official Team JFK Vixen. Listen to and Download The EP Below.